Another fun week of Big Ten hoops is led by Iowa dominating Michigan, Indiana upsetting Michigan St., and Wisconsin with two big wins. Six teams hit the Top 25 this week! There were 12 games, so let’s dive into it! Zavier Simpson’s triple-double with 11 points, 12 assists, and 10 rebounds helped Michigan cruise past Ohio State. Four different Michigan players got into double-figures, including 12 points off the bench for sophomore Isaiah Livers. Kaleb Wesson led Ohio State with 12 points, seven rebounds, and three blocks. Bruno Fernando’s 22 points and 10 rebounds helped lead Maryland to a convincing win over Northwestern. Maryland held Northwestern to just 31 percent from the field. Jalen Smith had 14 points and nine rebounds to support Fernando. Anthony Gaines had 18 points and seven rebounds to lead Northwestern. Wisconsin held Nebraska to just 28 percent from the field to beat Nebraska, despite being out-rebounded. Three Wisconsin Badgers were in double figures, including Ethan Happ who also had nine rebounds. Isaiah Roby had 18 points and nine rebounds to lead Nebraska. Rutgers strong effort on the boards helped them beat the struggling Indiana Hoosiers. Three Scarlet Knights were in double-figures, and they held Indiana to just 35 percent shooting. Romeo Langford led Indiana with 20 points and six rebounds in the loss. Five Minnesota players were in double-figures as they beat Illinois by 11. Minnesota shot a strong 50 percent in the win, compared to 45 percent from Illinois. Trent Frazier had a huge 30 point performance for Illinois in the loss, and two Fighting Illini were in double-figures off of the bench. Purdue shot the lights out at 55 percent, and survived the last-place Penn State in overtime. Conference scoring leader Carsen Edwards exploded for 38 points, and teammate Ryan Cline added 20. Lamar Stevens had 24 points for Penn State, and the Nittany Lions hit 30 free-throws to counter their poor 39 percent shooting. Iowa jumped out to a 13 point halftime lead on their home floor and used that to knock off the number five team in the country. Luke Garza and Joe Wieskamp had 19 and 16 points, respectively for the winners. Iowa held Michigan to just 32 percent from the field. Three Wolverines made it into double-figures. Wisconsin used a dominating second half after trailing at halftime to beat Maryland at home. Brad Davidson had 21 points for Wisconsin, and Ethan Happ had an 18 point, 11 rebound double-double as well. Bruno Fernando had a double-double to lead the Terrapins. 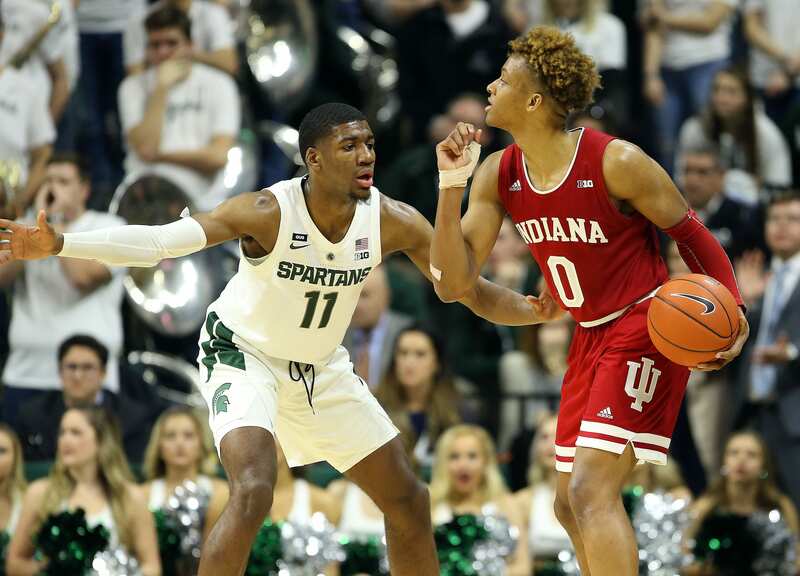 Despite losing Juwan Morgan in the first half to a shoulder injury, Indiana ended their skid with a huge road upset over Michigan St. Romeo Langford led the winners with 19 points, and Justin Smith had 13 points and 10 rebounds with the game-sealing block. Cassius Winston had a huge night for the Spartans with 26 points, eight rebounds, and eight assists. Ohio State shot the ball 53 percent to lead to a victory over Rutgers. Kaleb Wesson had 27 points and five assists, and C.J. Jackson had 20 points and seven rebounds. Despite the win, they trailed -11 in the rebound margin. Eugene Omoruyi had 19 points, eight rebounds, and six rebounds for Rutgers in the loss. Illinois balanced scoring and strong defense led them to a win over Nebraska. Kipper Nichols had 18 points off the bench, while Illinois held Nebraska to just 36 percent from the field. James Palmer Jr. had 22 points and eight rebounds for Nebraska, and Tanner Borchardt had 12 points and 18 rebounds. Purdue had five players in double-figures and shot the ball 48 percent in a win over Minnesota. Carsen Edwards led Purdue with 17 points, five rebounds, and five assists, and Nojel Eastern had 11 points, six rebounds, four assists, and two steals in an all-around effort. Amir Coffey had 22 points for Minnesota, and Daniel Oturu had 19 points and nine rebounds off of the bench.